Before I get into the nitty gritty of this review, I should clarify that a Mars bar here in Australia is more commonly known as a 3 Musketeers in the US, and it has a layer of caramel at the top. Plus, it’s a lot smaller here – about the size of a standard candy bar. What’s more, I really like Mars bars, and I like the whole crunchy/squishy textural thing (a la Snickers). With that in mind, I picked up this Mars Rocks bar to review. I’m sorry to say that the Mars company has messed with perfection, and this Candy Addict is not happy about it. The thin coating of chocolate has been replaced with a thick one, with ‘crispies’ stirred through it. In the middle you find what used to be a Mars bar, but is now only a pathetic excuse to carry the weight of the crispies. On first glance I’d rather hoped the addition of crispies was going to be a good one. Sadly, it’s yet another marketing idea gone wrong, and they ruined the texture of the nougat to boot! The only thing really nice about this bar was the wrapper – the silver leaf with the vaguely rock-and-roll font was kinda cool to look at. I found myself wanting to put on some KISS inspired make-up before biting into the bar. A lack of white face paint and a desire to eat chocolate right that minute kept that plan at bay and I bit into the bar, expecting chocolate nirvana. The added chocolate was really sweet, the textural addition of the crispies didn’t do much for me and the nougat was more grainy than smooth. Part of the joy of an original Mars is its inherent squishiness. This was just crunch, minimal squish, and an overwhelming mouth feel of messy, cheap chocolate. It was a good idea in theory, but just didn’t taste all that great in reality. It’ll be a while before I forgive the Mars company for this one. There is definitely something to be said for the “squishiness” factor when it comes to a favorite part of an eating experience. I have a friend who has a thing for “squidgy” cheese (i.e. the texture of the chewiness of the cheese), thus the “squidge” factor being paramount to her cheese-loving pleasure. I have a texture thing with foods, too, and especially candy. Too bad this one didn’t do it for you, ’cause it’s looks pretty darn tasty just from the photo! But true, texture can ruin a perfectly good piece of anything, but seems especially cruel when it’s candy! I won’t even mention what my 8 year old son said this looked like. Let’s just say his dog was referenced. Fortunately, in the world of little boys this is a positive thing and we’ll be sure to try it. Squish and all. Wouldn’t that make it more like a Milky Way than a 3 Musketeers? 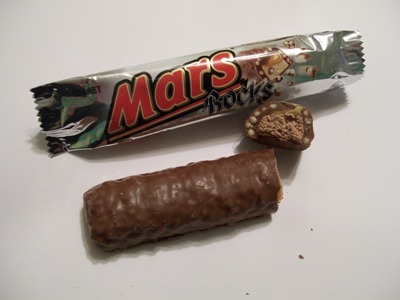 Amber is correct, an Australian Mars bar is like an American Milky Way. And just to confuse people, a Milky Way in Australia is basically what a Three Musketeers is in America :-). I agree about the garbageness of the Mars Rocks. My theory is that they were trying to emulate the ever-so-wonderful Boost bar and failed dismally. Ordered 3 Musketeers for my adult daughter who loved them as a child. She is disappointed as the mint it too minty, it was chocolate ones she loved. The cost of postage was far more than the cost of the item so she will not be getting any more from U.S. Mars bars are nothing like the old 3 Musketeers.